Home > My opinions > Skincare > My 1001 applications of L’oreal Paris Nutri-Gold Extraordinary Oil. My today’s entry is going to be about a new product by L’oreal Paris, which had its premiere fairly recently. The product has a nourishing formula which core is composed of eight natural oils. For me, it is fairly universal tool for face skin care. Why do I find this product universal? Because it can be used in countless ways! passion fruit oil (moisture and skin protection). L’oreal Paris Nutri-Gold Extraordinary Oil states that this natural oil can be used in numerous ways and will produce satisfactory effects regardless of the method applied. Let me introduce a few ideas for face skin care with Nutri-Gold Extraordinary Oil. I have to admit, that this is just the beginning of my tests with the product therefore I’m going to present just a few manners of application. Instead of a cream – this oil works just perfectly as a moisturizing makeup base. It can replace a regular moisturizing cream. Makeup foundation enrichment – I mix a few drops with my foundation, which was too heavy for me to wear. Thanks to this procedure, my cosmetic becomes less dense and additionally became enriched with nourishing substances. Local regeneration – every time I notice dehydrated spots on my skin (most often on cheeks and temples), I massage 1-2 drops of the oil into the very place. Relaxing massage – I like to give myself a quick face massage, especially in evenings. Owning to Nutri-Gold Extraordinary Oil beautiful fragrance and decent properties, it is just a perfect product for this bedtime procedure. Nourishing makeup removal – I tested this oil also as a makeup remover. Unfortunately, it didn’t pass the exam as an individual product for makeup removal. Therefore, now I add it to my makeup removing lotion just to improve its nourishing action. Brightening up of skin – my natural skin brightening-up due to oils: I put 1-2 drops onto my palm, then I damp my fingertips in it and pat the product in a very gentle way into the spots I want to make brighter. Lip balm – I pat Extraordinary Oil into lip skin in order to improve its nourishment and provide hydration. Nourishment of eye skin area – recently, I’ve started testing oil as a replacement of an under eye cream. I apply Extraordinary Oil evening and it’s been working as a regular under eye cream so far. 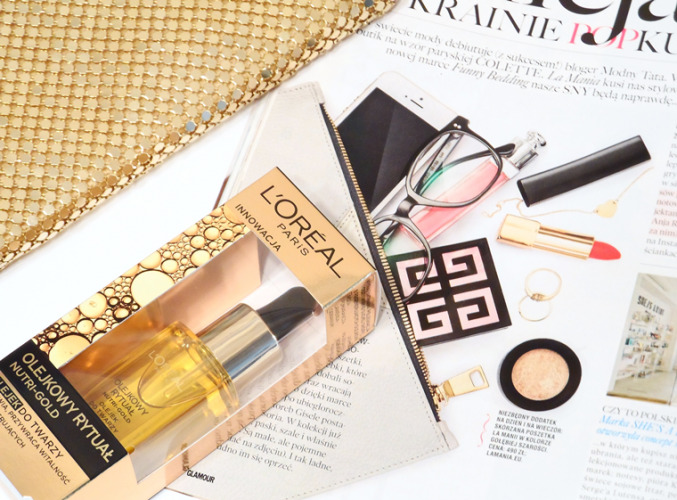 Do you know some other application of L’oreal Paris Nutri-Gold Extraordinary Oil? What can you improve with Botox? Ice Chic from Golden Rose – Clinker from the Beginning of the Year?